Helping Parents & Sitters Just Say Yes! We’ve just put out a new version of our app and it’s one we’re really excited about. 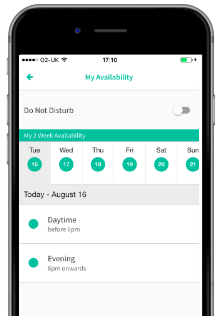 This is mainly because amongst the many fixes and improvements is new functionality allowing our sitters to schedule their availability for the next fortnight. It’s something both parents and sitters have been asking us for since day one. Parents understandably only want to see the babysitters that can do their sit. And our hero sitters hate saying “No” to parents, so getting requests they can’t do isn’t great for them either. This is a feature that will allow us to start getting “smarter” about how we surface babysitters to parents. Ultimately, we want our app to help parents easily find the best babysitters for them in the fastest possible time. How do we do this? By making the results they see in their search (who they see and in what order) automatically driven by a sitter’s credentials and activity on the bubble app. What will define “best babysitters for them”? It’ll be a number of things, but how quickly a sitter responds and how often they say “yes” to requests will be two important factors. And now that we’re giving babysitters the chance to update their availability, this is activity we can begin to consider in the app’ search engine. We’ve learnt a huge amount in the weeks since we’ve launched, and one theory we’ve seen play out quite clearly is that for many parents, the idea of going out can come and go pretty quickly. As parents, we’re busy, often exhausted and quite used to just staying home. So if our plans – including the sitter – don’t get sorted double-quick, it’s all too easy to revert to a night in with Netflix. Making sure we get our parents’ sit requests accepted rapidly is therefore key for us and is driving a lot of our thinking right now. And while the feature we’ve released this week is no silver bullet (becoming “uber-like” is much harder then they make it look!) we hope it’s a good first step. P.S thanks to some of our hero sitters Harriet, Georgia, Elena, Katie and Gaby for their feedback and help designing the availability tool! Not yet on bubble? download the app on iOS or Android today!